…Midnight came. My body felt like it weigh a tonne. I felt like it was jus few minutes ago I fell asleep and now I had to wake up to continue hiking. I was throwing a fit. I didn’t want to wake up. After few attempts from my friends waking me up. I finally up and getting ready to conquer the mountain by sunrise. Focused and determined. 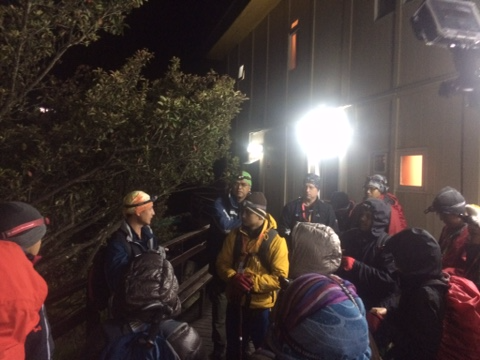 I headed outside to listen to the briefing before we started hiking. At that moments, I no longer care whether my friend will hike together with me or I will hike alone like yesterday. All I know is that I will hike to the top with or without her. It was pitched black outside. I looked up the sky, there’s few stars shining down. Twinkle twinkle little star played on my head. We climbed up stairs, we hiked the path, we stopped for a drink, we chatted, we laughed. Wait. What? We? Yes, we. I was with Abang Ajis and two of our guide. But as usual, we were among the last of the crew trailing the night away. 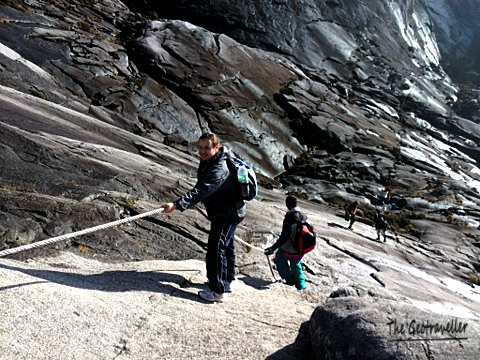 We listen to our guides’ experience, the history of Kinabalu, their work and family. It really took our mind off the cold and the tiredness. 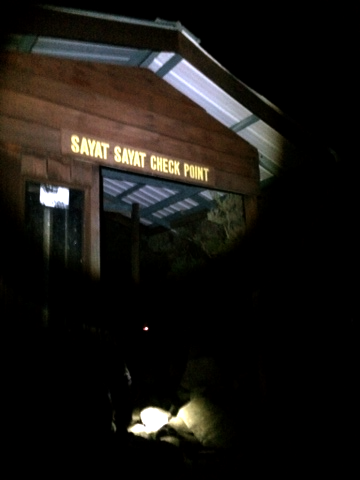 At Sayat-sayat hut, I began to feel short of breath and felt nausea, it was due to the ascending altitude. I am tired and my legs kinda hurt. But at this point it seems pointless to give up. I have another 3 hours before the sunrise. I continued. At one point, I was so sleepy and can barely open my eyes, I fell few times because I fell asleep during hiking. Can you believe it? What a sleepyhead. The guide then, took my hand and we walked together, hand in hand. He wouldn’t let me stop and sleep. He did not want me to miss the sunrise. Reaching the summit. Not going to give up here. And after I sprinkled some water to my face. I was wide awake and I cant believe what I am seeing. I am at the top already. I rushed to hike the Lows gully, the famous top, but my guide stop me and tell me, he’ll show me where the sun would look the prettiest. And we sat and watched the sun rising and I remembered it as the far most beautiful sunrise I’ve ever witnessed. My heart contented. I did it. I really did it. But it is not complete yet until you had one of these picture taken here. This is how it looked like going down. It was pitch black during summit attack. Now everything was clear. The view descending from summit. 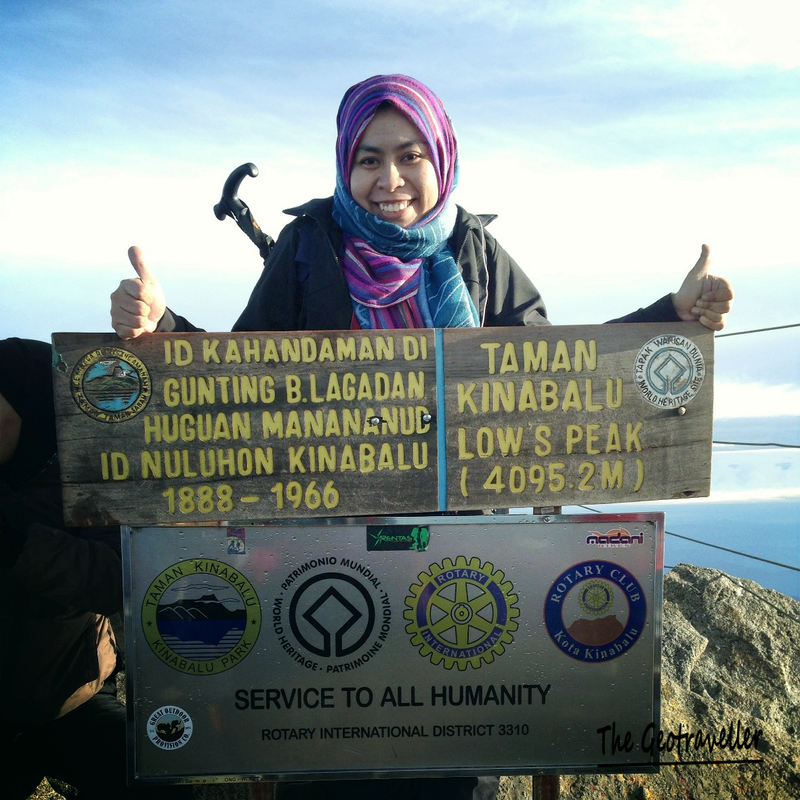 And that is my journey, chasing the sun to the top of Kinabalu. And the rest was history. 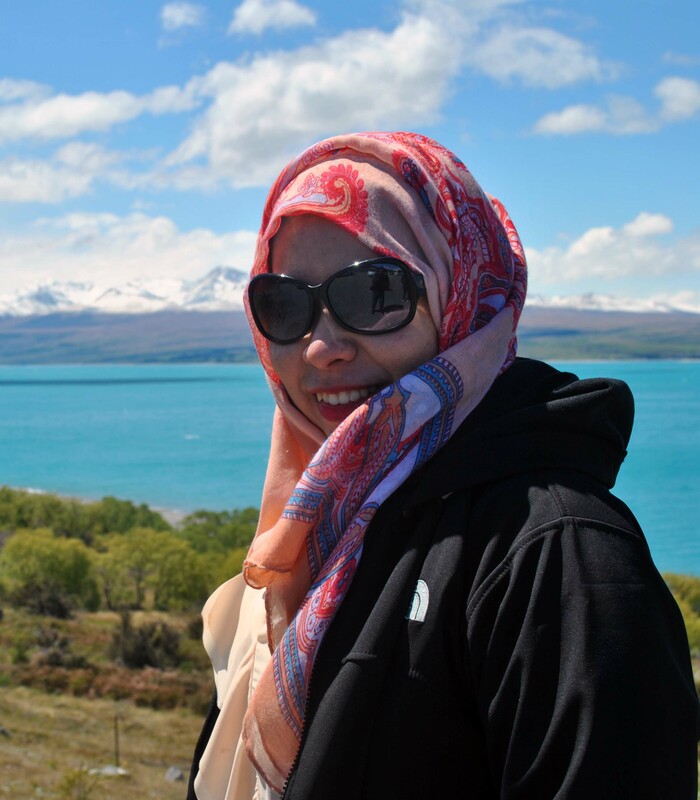 Well now that I have conquered myself to the top, I will share with you the TOP TEN TIPS that will help ease your journey hiking up Mt Kinabalu. 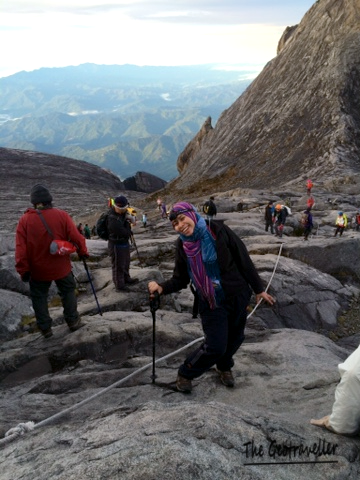 ANYONE can climb Mt Kinabalu. Well, If I can do it, certainly ANYONE ELSE can too. It’s more of a mental strength rather than physical strength. But high stamina surely wouldn’t hurt. The key is to exercise regularly few weeks/months before hiking. STAY HYDRATE. Bring at least 2L of water and some energy drinks. PACK LIGHT. Bring the necessary things only, no need to bring your whole wardrobe. GOOD SHOE AND SOCK is a wise investment. Choose a comfortable shoe and wear a thick socks is recommended. Having all your toe-nails intact and no blister is a real victory. HIKING POLE is a knee savior. Get One. This will ensure you still can hike at the age of 60 without a bad knee. UPDATE PLAYLIST. Trust me, with the right groove, you’ll be there sooner. BRING HEADLAMP. It is dark. Very dark. CAMERA. Stop and smell the flower. The journey to the top holds just as many rewards as getting to top. Lat but not least. RESPECT the environment. You see the cliché warning “Take Only photograph, Leave only footprints” Yeah, follow that. This is especially hard for me because I always had the urge to take home a small chunk of rock as a souvenir. But, there’s always time and place for that, use your common sense.